You may have seen news recently about an alert from the U.S. Food and Drug Administration (FDA) regarding the potential for adverse neurologic side effects in pets with a history of seizures who have been treated with of certain flea and tick preventives. These are products in the isoxazoline class such as Nexgard, Simparica, Credelio, and Bravecto. It’s important to note that this is just an alert and not a recall. Nothing is more important to us than the well-being of our patients and the safety of the products we prescribe. With over 80 million doses of Bravecto sold worldwide, the reported signs, including seizures, remain very rare—less than 1 per 10,000 dogs. 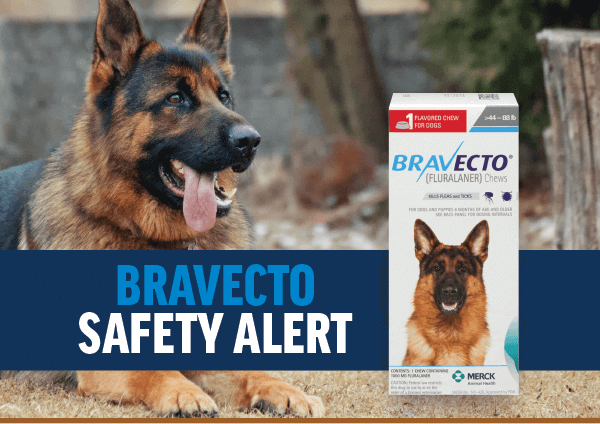 •	The FDA still considers Bravecto a very safe product. •	The instances of seizures with use of Bravecto are incredibly rare. •	PMC of Edmond has sold thousands of doses with no reported neurologic side effects. •	If your dog has a history of seizures, consult a veterinarian. We will continue to stay in communication with the manufacturer and our clients so that you can trust our recommendations and make informed decisions about your pet’s care. Please don’t hesitate to call us at (405) 696-4185 if you have more questions about Bravecto or any other flea and tick preventives.